I would guess that it's kind of unusual when your employer asks you, "How can our organization improve?" and you can't really think of much. That's how it was for us this week. We are in Minneapolis right now (staying indoors as much as possible because it is way, way, way too cold here!) at our mission organization's National Office. We work for ReachGlobal, which is the international mission of the Evangelical Free Church, and on every home assignment, we come here for a few days of debriefing and meetings. I love that ReachGlobal holds us to high standards. They put high priority on healthy people and healthy marriages and healthy teams. I love that ReachGlobal wants all their people to be working in their "sweet spots." I love that they want us to love what we are doing. I love that they encourage us to dream big, and then hold us accountable for working towards it. I love that they take good care of us. I love that I can come to the National Office and see all the faces behind all the emails and feel like they all genuinely love us and love serving us and love what we are doing around the world. I love that ReachGlobal believes that pastoral care and mentoring are really, really important. I love that they make sure we have the finances we need to do our jobs effectively. I love that our leader, Tim Addington, is such a visionary and wise and godly man. I love that he leads by serving. I love that he encourages all of us to do what we were created to do, and that he is open to new ideas and crazy ideas, as long as they fit into ReachGlobal's values. I love that ReachGlobal emphasizes church multiplication and national leadership. I love that they have really, really big dreams and really, really big plans to make those dreams come true. I love that they include internationals on their leadership teams so that all the dreams aren't just coming from America. I love that prayer is really, really important to them. I love being part of an organization that is doing a great job. I love that I feel like I can trust the decisions that they make. I love knowing that I get to be a part of something that is so much bigger than I am. So....anyone want to join in? I used to be anti-American. A lot of Third-Culture Kids are. In my twelve-year-old mind, everything about America was shallow, boring, and brutish, while everything about Liberia was beautiful, interesting, and perfect. Such are the black-and-white perspectives of youth. I have grown up since then, and now I have spent half my life in America and the other half in Africa. I am not anti-American anymore. I know it might seem that way sometimes. When I wrote the post about the lack of people willing to jump my car, I know it might have seemed that I was idealizing Tanzania. I was frustrated that day. And though every single thing I wrote was the truth, I did know, in the back of my mind, that it wasn't everything that could have been said. want to be in a serious accident in Tanzania. It is, in fact, one of my biggest worries about living there. stop and help the person. Instead, they should drive directly to the nearest police station and report it. Because stopping to help automatically insinuates guilt. And in situations like this, mob justice takes over more often than not. Drivers are beat up. Or killed. We have seen it happen. The truth is, that even though Tanzanians are always happy to help with a dead battery or flat tire, if there is a serious accident, they are more likely to rob me than help me. So which culture do I like better? Which culture is better? Is it even a valid question? Tanzanians are some of the most generous people I have ever met. Once, we were at a pastor's house after church. He bought sodas for Gil and I while his children looked on. We found out the next day that he had no money to feed his children. Instead, he had bought sodas for people who already had a whole case of them in their kitchen. In America, charitable giving makes up only 2% of the GDP. However, Americans are incredibly ambitious and optimistic. They have a great spirit of entrepreneurship and innovation. Africans are extremely resourceful with what they do have. For example, I have never seen so many things created out of old tires. Americans produce a quarter of the world's trash (while only making up 5% of the world's population). Tanzanians prioritize people over schedules, which means they have strong relationships but are often late to events. Americans prioritize schedules over people, which means they are usually more productive. Tanzanians value politeness and respect for the elderly. Americans value efficiency and customer service. Tanzanians are community-oriented. Americans are isolated. In Tanzania, we worry about being robbed by a gang invasion. In America, we worry about our children being shot at school. Americans value comfort and convenience and will fight hard to get it. Tanzanians value peace and will put up with a lot of discomfort to maintain it. Neither is better. Neither is worse. Both have something to learn from each other. But it makes sense, doesn't it? Since all mankind is created in the image of God, then we reflect His image when our cultures reflect great good and great beauty. Just in different ways. But we are also all desperately fallen, which is why all cultures also contain great evil. Just in different ways. Which is why we all need Jesus. P.S. Please keep in mind that I am most certainly speaking in generalities. Not everyone in either culture fits these descriptions. I think of her birth mother at this time of year, the one who lost her life on this day, while giving her daughter life. I rejoice that now she is mine, that I get the privilege of watching her grow. But there is loss, too. She has a very high-energy older sister. She has a super-turbo-psycho energy older brother. And she is not high energy. But she is fiercely determined and fiercely competitive, and she works hard to keep up with them, often exhausting herself in the process. I think her favorite days are Fridays, when Grace and Josiah are at on-site classes and it's just her and me. Unless I give her puzzles and books, she plays with her dolls, by herself all day, usually quietly singing out her stories. 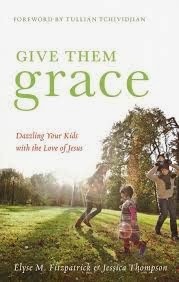 Give Them Grace by Elyse Fitzpatrick makes me want to throw away all the other parenting books and blogs and articles I've ever read. I thought it was a bit repetitive and I found her sample parenting "speeches" she would give to kids to be long-winded and not very realistic (for me), but the heart of this book is amazing, refreshing, and life-altering. I need to review it every year. In an age where everyone seems to have a "system" for churning out "good" kids, Elyse gets down to the biblical basics of parenting--and probably most of us have it wrong. This book went deep to my heart....with conviction but also blessed relief. It is a must-read for every Christian parent or teacher. "At the deepest level of what we do as parents, we should hear the heartbeat of a loving, grace-giving Father who freely adopts rebels and transforms them into loving sons and daughters." "We have far too high of a view of our ability to shape our children and far too low a view of God's love and trustworthiness." 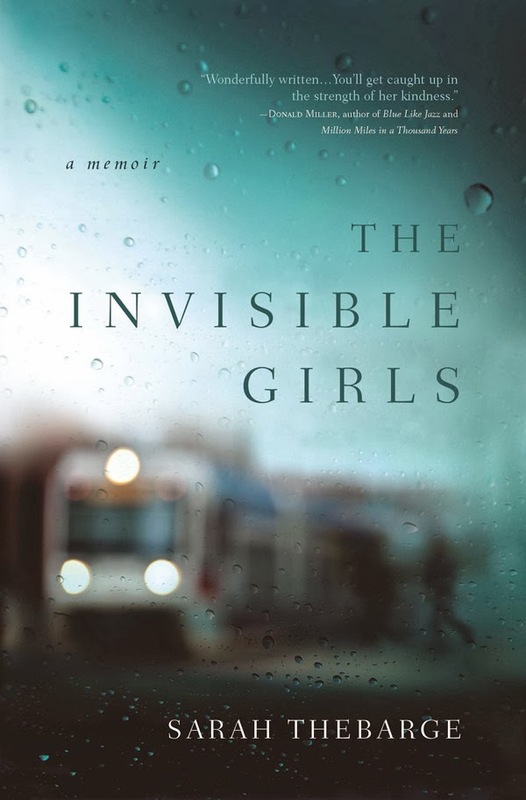 I read The Invisible Girls by Sarah Thebarge because it was written by a girl I knew in college. It is beautiful and haunting and I would recommend to anyone. Sarah tells the story of how at age 27, as a graduate student at an Ivy League school and a very bright future ahead of her, she lost everything to breast cancer. Intertwined in this memoir is the story of how God brought redemption to her suffering through her chance connection to a Somalian refugee family. You will be blessed by this book. Teaching Redemptively by Donovan Graham takes the subject that is near and dear to my heart--Biblical worldview--and demonstrates clearly and concisely how it should form Christian teaching. As someone who has been involved in education for my entire adulthood, I found it incredibly interesting and thought-provoking. Highly recommended for anyone involved in Christian education. "[G]race cannot be comprehended, let alone lived, in an environment so permeated with a philosophy of life that says, 'Pull yourself up by the bootstraps, work harder next time and you'll get it, nobody gets something they don't deserve.' If we want our students to live the gospel after they leave school, then we must help them experience it in school." 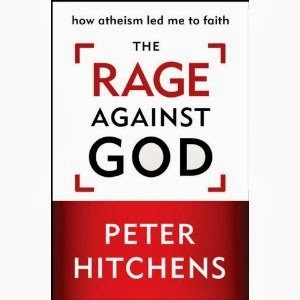 The Rage Against God is written by Peter Hitchens--brother to atheist Christopher Hitchens--which is what makes this book so interesting. Part memoir, part history lesson, part apologetics book for the existence of God--I found it fascinating. "Only one reliable force stands in the way of the power of the strong over the weak. Only one reliable force forms the foundation of the concept of the rule of law. Only one reliable force restrains the hand of the man of power. And, in an age of power-worship, the Christian religion has become the principal obstacle to the desire of earthly utopians for absolute power." 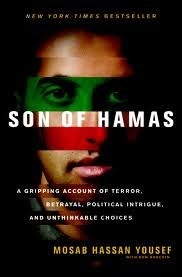 If Son of Hamas had been written as a book of fiction, I would have dismissed it as far too far-fetched to be realistic. I mean...seriously? A son of one of the founding members of Hamas, who becomes an Israeli spy, who becomes a Christian? How ridiculous is that? That's what's so crazy....it's true! It reads like a spy novel, but the entire story is true...a biography, in fact. Totally captivating. One of my very best friends is named Janelle. She was a teacher for seven years with us at HOPAC. During one of those years, she lived in our guest house. She was one of the most remarkable teachers I've ever known. If you ever saw her students lined up, waiting to go somewhere, you would see Janelle gently place her hands on each child's head, one by one. She was praying for them. Always. Never stopping. After Tanzania, Janelle spent two years teaching in one of the most difficult, dangerous countries in the world. When she got married a few years ago, she and her husband moved to another difficult country--where the living conditions are so hard that "difficult" seems like an understatement. Janelle has willingly made so many sacrifices in her life, and yet she has always been one of the most gospel-centered, unselfish, loving people I have ever met, and she is one of my heroes. On Saturday, I found out that Janelle's precious 16-month-old son, her firstborn, fell out of a second story window and lost his life. I got the news as we were leaving for a three-hour drive to San Diego. I cried the entire three hours. I alarmed my children, who have never seen their mother cry so hard or so long. I can't imagine. I just can't imagine. I struggled with whether to write about something so personal. Janelle is my blog's biggest fan and she will probably read this. She left me a comment on a post just a day before the accident. I write about things that are interesting or important to me. But how can anything be interesting in light of such a tragedy? How can anything else be important? How can I write about anything else without acknowledging such an event has taken place? I know these things happen all the time around the world. But when it touches someone close to you, life stops. Everything stops. Everything is gray; everything has shadows. Janelle and her husband have a Firm Foundation and I have no doubt that they will glorify God in the midst of their nightmare. But right now, there are no platitudes. There are no answers. There is just sadness with hope, and the reminder that though we may try and try to make our lives feel like Disneyland, the reality is that we live in a broken, tired-out, miserable, groaning world. We groan. And we long for That Day.